NB:Frakt på disse må avtales på forhånd! Universal MK2 package includes: (1) Telinga handle with gold plated Neutrik XLR connectors on 1,5 m length adjustable Gotham Audio cable // (1) Zeppelin mic holder with a surrounding large windshield and protective aluminum bars (inside the Zeppelin mic holder) // (1) pair of mounted silicone rings to securely place a microphone facing the dish // (1) mounting kit to attach the dish very easily within minutes // + (1) Telinga V2 foldable parabolic dish. The Universal Kit version 2 ready to use with your own omni or cardioid microphones. Telinga Universal MK2 a complete parabolic dish system for your own microphones, easily mounted in the included Zeppelin holder with the mic facing the dish (cardioids & omnis) or outwards of the dish (omni mics only). The most effective way to use a range of different microphones - switched in seconds, on location without using any necessary tools. From unboxing, the complete Telinga Universal MK2 is ready to use within a few minutes and can be stored and folded together (including the foldable V2 dish) in the Telinga Softcase for easy travelling. The Zeppelin microphone holder features a large pre-installed windshield with the updated 45 PPF Cell Foam material which easily carries most pencile style microphones (diameter equal or less then 25 mm) such as Schoeps, Sennheiser, DPA by using the pre-installed silicone rubber rings at the front of the holder. Since you can access both the microphone holder and dish from behind the setup you may place a miniature microphone or even two (for stereo experiments) - one inside the Zeppelin holder and another mounted to the edge of the dish for example. If you use DPA 4060:s you may use the surface mounts. The Universal MK2 handle is fitted with a new 1.5 meter length-adjustable high quality Gotham Audio cable with Neutrik gold plated XLR:s. Since you may adjust the full length of the cable from bottom and top of the handle to the Zeppelin holder, you don´t have to use any adapters. A new "stopper" attached to the handle cable may be secured in the gray tube to prevent unwanted sounds travelling to the microphone from behind the system when having the mirophone facing the dish center. 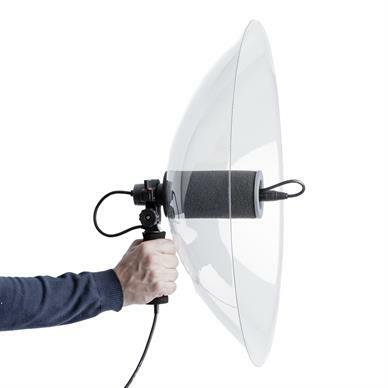 Recommended maximum length for microphones mounted facing the dish = 12 cm / 5 inches.